Historic Charleston Bed and Breakfast - Historic charleston's original service. Our representatives will describe our options and match you with lodging to suit your needs . . . each location is inspected by our staff . . . most of our locations are within walking distance to dining, shopping, museums and points of interest! 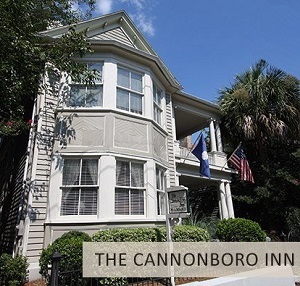 Cannonboro Inn - Prepare to be pampered at two of Charleston's bed and breakfasts, the Ashley Inn or Cannonboro Inn. The pace is relaxed - The decor is subtly elegant and inviting. Our knowledgeable, friendly and helpful staff is waiting to assist you. We are conveniently located in the residential historic district six blocks due west of the Charleston Visitor's Center, which is the beginning of the commercial area of the city. Barksdale House Inn - The Barksdale House Inn, built in 1778, is your home away from home while exploring the City of Charleston. We are located within the historic downtown district and are walking distance to shopping, dining, tourist attractions, and the famed Market Street. This Inn offers 14 rooms with private baths, complimentary breakfast, newspaper, wireless internet access and parking. Our knowledgeable staff is happy to assist you with suggestions on where to begin exploring our beautiful city and its magnificent homes, gardens, and parks. Please be sure to join us each afternoon for Iced Tea, Sherry, and refreshing delicate bite. Our porch overlooking the garden is a perfect setting for relaxing in the evenings after a long day of sightseeing! Elliott House Inn - With its tranquil cobblestoned courtyard, original hardwood floors and breezy piazzas, the Elliott House Inn invites a historically rich Charleston experience. Once a private residence, our Queen Street inn effortlessly pairs the intimacy of a bed and breakfast with the services of a boutique hotel. Encounter our romantic retreat in the heart of Charleston, delighting first-time visitors and charming return guests. The Governor House Inn - The Governor’s House Inn in Charleston, SC offers the rare pleasures, aristocratic comforts and romantic grandeur of a pre-revolutionary National Landmark. With magnificent drawing rooms, boudoir staterooms, and expansive veranda porches, it is no wonder that the former Governor’s mansion was proclaimed the most glamorous of Charleston inns by Travel Holiday. Book Governor’s House Inn for an extraordinary wedding venue; luxuriously appointed lodgings for your bridal party; or a stunning setting for your corporate retreat or vacation. We are the #1 B&B in Charleston on TripAdvisor, and we’re located within walking distance of Charleston’s highest rated dining and attractions. 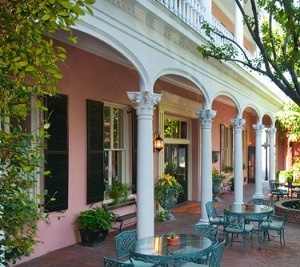 Lodge Alley Inn - Charleston, South Carolina, is a city synonymous with Southern hospitality. First, there’s the historic city then there’s the beach, and of course, the food, charm and authentic warm welcome that you won’t find anywhere else. You’ll feel especially at home at The Lodge Alley Inn™. Upon arrival, guests will discover original pine floors and red brick walls, thick Oriental carpets, period reproductions and intimate parlors with fireplaces. Adding to the ambiance of this resort, Victorian-style villas blend old-world charm in the common living areas with modern kitchens and baths. The Meeting Street Inn - The Meeting Street Inn offers distinctive lodging in the heart of Charleston's historic district. Located opposite the bustling City Market, the Inn is surrounded by Charleston's finest restaurants, boutiques and antique shops. Everything that is unique to the "Holy City" is no more than a pleasant stroll from your front door! In the style of the Charleston single house the luxury inn's fifty six guest rooms open to sunny piazzas overlooking our garden courtyard. Each room features antique reproduction furnishings and four poster "rice" beds. The result is a delightful blend of 19th century charm and 21st century comfort, rivaling that of the finest luxury hotels. Rutledge Victorian Bed & Breakfast Inn - The John Rutledge House is the only home of a signer of the Constitution of the United States that serves as both a living historic landmark and a grand bed and breakfast. Its historic setting, magnificent architectural details, and period décor mix with timeless hospitality and amenities to create an experience that's equal parts celebration and luxurious restoration. Middleton Place - Middleton Place is a National Historic Landmark and home to America’s Oldest Landscaped Gardens. 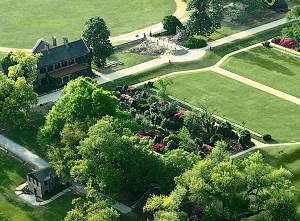 The Garden Club of America has called the 65 acres “the most important and most interesting garden in America”. Centuries-old camellias bloom in the winter months and azaleas blaze on the hillside above the Rice Mill Pond in the spring. In summer, kalmia, magnolias, crepe myrtles and roses accent a landscape magnificent throughout the year. The Gardens have been planned so that there is something blooming at Middleton Place year-round. Magnolia Plantation and Gardens - Welcome to Magnolia Plantation and Gardens. Magnolia has been selected as one of "America's Most Beautiful Gardens" (Travel + Leisure Magazine), and is the only garden honored with this distinction in the State of South Carolina! Historic Charleston Foundation - Established in 1947, Historic Charleston Foundation is dedicated to preserving and protecting the architectural, historical and cultural character of Charleston and its Lowcountry environs, and to educating the public about Charleston’s history and the benefits that are derived from preservation. Preservation Society of Charleston - The Preservation Society of Charleston is dedicated to recognizing, protecting, and advocating for the Lowcountry’s historic places. 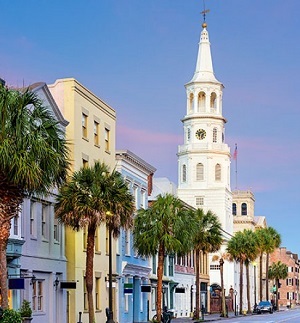 One of the most important aspects of our work is participating in public meetings where decisions are made that affect not only Charleston’s historic districts, but also how the built environment of the city at large takes shape and functions. A few of the regular public meetings we attend are the Board of Architectural Review (both Large and Small), the Board of Zoning Appeals, Planning Commission, and City Council. We review proposals for alterations, additions, and proposed demolitions to historic properties in historic districts as well as proposed new construction in the area. Preservation Society staff also meet with property owners, architects, developers, and neighborhood association leaders to discuss proposed projects as well as offer technical advice. We represent the interests of our membership and friends who believe that some things are worth saving. Save The Morris Island Lighthouse - The lighthouse had been in private hands since the GSA sold it at auction in 1965 to a private citizen. A businessman who hoped it would compliment plans for a camping ground on Morris Island purchased it. One year later, the lighthouse was purchased by another entrepreneur who was a partner in the firm that had just bought all of the land, high and submerged, on Morris Island. The lighthouse was intended to compliment an eventual real estate development. In 1996, a Columbia businessman unwillingly ended up with the lighthouse in a foreclosure action on a mortgage. While in private hands, the lighthouse suffered further erosion, deterioration and neglect. Southeastern Wildlife Exposition - The Southeastern Wildlife Exposition (SEWE) is a three-day celebration of wildlife and nature through fine art, conservation education, sporting demonstrations, food, drink and the people who honor them all. The largest event of its kind in the US, SEWE makes its home in Charleston, South Carolina and plays host to hundreds of artists and exhibitors, plus experts in wildlife and nature art – all eager to share their art and insights with more than 40,000 attendees. Spoleto Festival USA - For 17 days and nights each spring, Spoleto Festival USA fills Charleston, South Carolina’s historic theaters, churches, and outdoor spaces with performances by renowned artists as well as emerging performers in opera; theater; dance; and chamber, symphonic, choral, and jazz music. Now approaching its 42nd season, Spoleto Festival USA is internationally recognized as America’s premier performing arts festival. Cooper River Bridge Run - The Cooper River Bridge Run provides a world-class 10-K foot race. The race promotes continuous physical activity and a healthy lifestyle through education and opportunity. The Cooper River Bridge Run is the best organized and best conducted 10-K race in the world. It includes world-class competition in a unique setting with unparalleled participant satisfaction. It broadens community cooperation and participation in healthy events throughout the year. The Cooper River Bridge Run serves as a model of health motivation for other communities throughout the world. Real Estate in Charleston - Moving to Charleston? 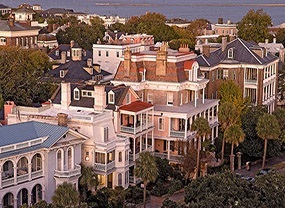 Search for homes and lots listed in waterfront historic downtown Charleston, Mount Pleasant, Daniel Island, Sullivan's Island, James Island SC and more ... Charleston, like its people has many personalities...one historic city with many islands making it increasingly applealing, widely diverse and multicultural. Illustrated Area Map - Charleston SC, founded in 1670, is one of America's oldest cities. She played an important role in the American Revolution and was the site of the Secession Convention that in 1861 dissolved the Union, which eventually lead to the The War Between the States. This site is all about the development of Charleston, South Carolina. The highlight of the site is Charleston Illustrated, an architectural map of the downtown historic districts. We've also added pages containing original and antique maps, links to books, and information about local sights and businesses. Post & Courier Newspaper - The Post and Courier, the South's oldest daily newspaper, traces its roots to The Courier, founded in 1803, and The Evening Post, founded in 1894. In 1926, the two newspapers were drawn closer together when The Courier, which had then become The News and Courier, was purchased by The Evening Post Industries Company. Both newspapers maintained separate news staffs until the 1980s, when those staffs were combined. In 1991, when it became apparent that reading habits were better served by a single edition of the newspaper - a morning edition - the two papers were merged to become The Post and Courier. The newspaper is now published by The Post and Courier, Inc.
South Carolina Heritage Corridor - The South Carolina National Heritage Corridor (SCNHC) was designated by Congress in 1996 as a National Heritage Area (a program of the National Parks Service). Stretching 17 counties and 320 miles across South Carolina, the SCNHC is committed to promoting and preserving the cultural, natural and historic resources of South Carolina. We’re here to guide you along the way as you discover some of the most unique places in the Palmetto State. Charleston Waterfront Property - Agents specializing in Residential and Investment Real Estate in the Charleston, South Carolina area. She knows the schools, the restaurants, the neighborhoods...A consistent top producer, Ariel Trouche can provide invaluable assistance with the successful marketing of your present home or in the selection and financing of your next home. Ariel specializes in Residential and Investment Real Estate in the Charleston, SC area. Pleasing Terrors Ghost Tour has been consistently rated by reviewers on both Tripadvisor and Yelp as one of Charleston’s best ghost tours. Our tour guide, Mike Brown, was fantastic. He has definitely put a lot of research into the various stories and locations that are explored on the tour. 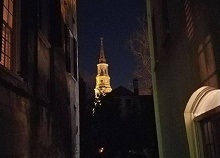 A great way to get some of the history of Charleston as well as a some great, spooky storytelling! Sign up for special offer. Copyright © 2019 Old Charleston Walking Tours. All Rights Reserved.